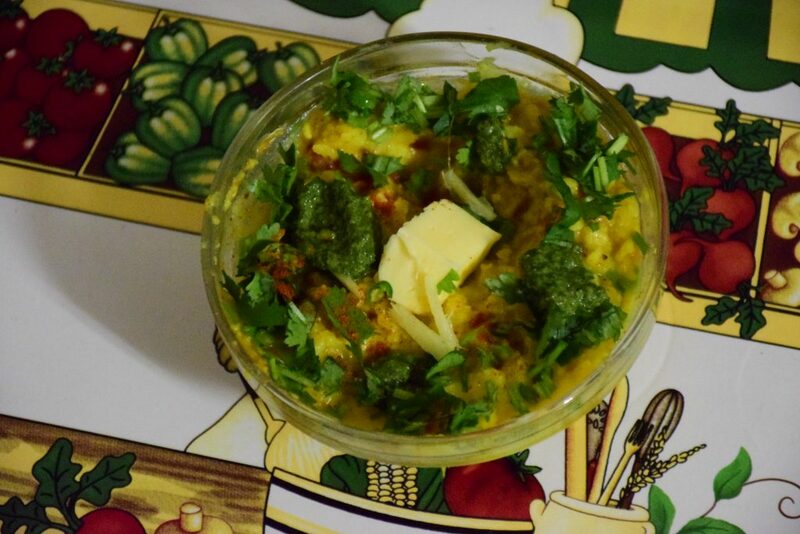 On one such day while talking to my sister-in-law over phone, she suggested me to try this muradabadi Dal. I have heard “special moon dal chaat” from my mom too. But after trying it out, I could understand why it is so popular and why Prince Murad could give up anything but not the Dal. This Dal’s history dates back to Jodha -Bai who revolutionized the tasting buds of Mughal kings and princes. Prince Murad , Akbar’s grandson, was a frugal eater ,but relished this Dal 3 times a day in different forms of Chaat. 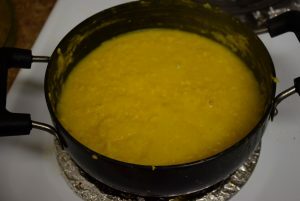 Shah-Jehan , Akbar , Aurangzeb were all ardent fans of this Dal. 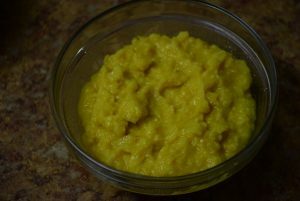 It was named after Prince Murad , since it was his demand to make a Dal (ususally served as Dal-baati-choorma :Toovar Dal) which is different from the rest and could bring in a new flavor. So after many attempts, the cooks of Jodha’s kitchen finally brought this dal before him and he finished it all in 1st attempt. They served him again twice in different forms, and he cleaned the bowl till the last drop. Since then , this dal became his routine. So, bringing to you Muradabad’s(a small district in U.P.) and Haridwar’s special starter !!!! 1. 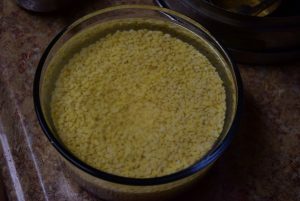 Wash and soak the moong dal in 3 times the water for 30 mins. Soaking not only reduces the cooking time, but also extracts the anti-nutrients of the dals. 2. 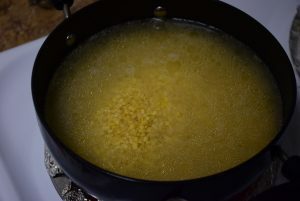 In an open pan, wok or pressure cooker add ghee and heat it. For an open pan or wok(kadhai) add 2.5 cups of water and for pressure cooker add 3 cups of water in 1 cup dal. Also add Haldi and salt. Cover the pan partially with lid and let it cook on medium to high heat. In pressure cooker cook until one whistle and then turn off the heat. 3. In wok, it took 30 mins to cook completely . Mash it with a whisk or spoon once fully cooked. 4. While the Dal is soaked , prep for the chaat ingredients. 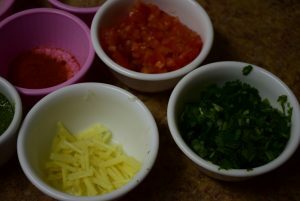 Finely chop the tomatoes, chillies, ginger and cilantro leaves and keep them covered in separate bowls. 5. 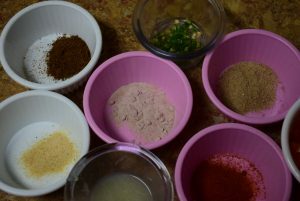 Also gather the spices like black salt, hing,chaat masala,red chilli, hari chutney etc. Dry roast cumin seeds and then ground them in a mortar-pestle (Immamjasta) into powder. 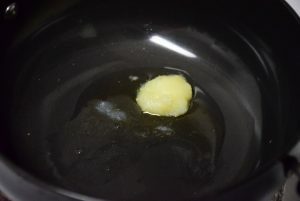 Squeeze out 1 lemon juice in a bowl and set aside. 6. 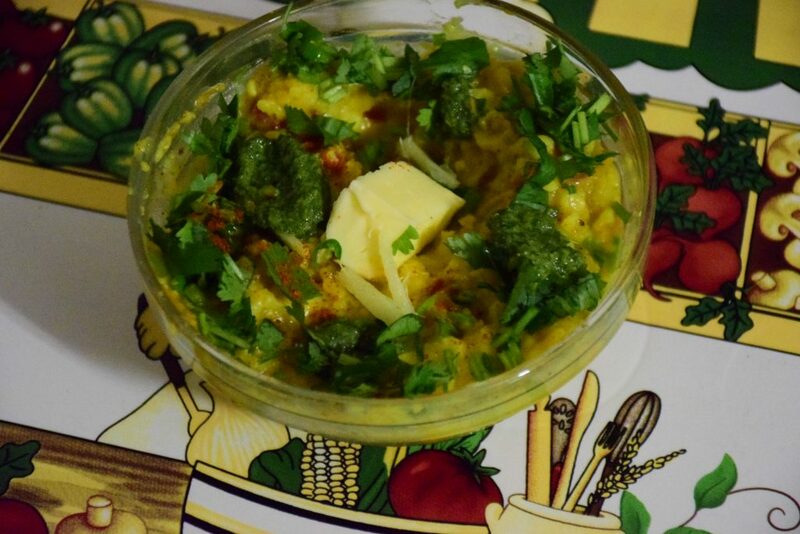 Take out the cooked dal in one serving bowl. Add the chopped tomatoes, green chillies , ginger and mix these well first. 7. Next sprinkle the chaat masala, cumin powder at the edges , black salt and cilantro leaves on top . 8. Add little lemon juice and 1/4 tsp hari chutney and mix everything well. 9. In the end , garnish with ginger, cilantro,red chilli powder and cumin powder. Top of with a dollop of butter and serve like an appetizer. This appetizer or starter will fill your mouth with a mix of flavors and you can have it as much as you want without any guilt feeling. 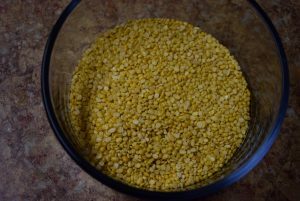 Moong Dal is very light and healthy for our bodies. The creamy texture of dal combined with the crunchy spices will leave you mesmerised. Try this and share your reviews with me. I haven’t added onions and garlic, but you may go ahead and add them too. Everytime I talk to my close ones, we end up having a long conversation on food. I think its our nation's food which has bound us together in such a diverse environment. 🙂 On one such day while talking to my sister-in-law over phone, she suggested me to try this muradabadi Dal. I have heard "special moon dal chaat" from my mom too. But after trying it out, I could understand why it is so popular and why Prince Murad could give up anything but not the Dal. This Dal's history dates back to Jodha -Bai who revolutionized the tasting buds of Mughal kings and princes. Prince Murad , Akbar's grandson, was a frugal eater ,but relished this Dal 3 times a day in different forms of Chaat. Shah-Jehan , Akbar , Aurangzeb were all ardent fans of this Dal. 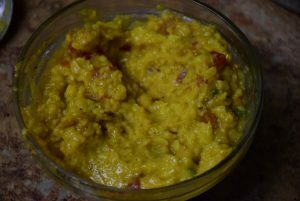 It was named after Prince Murad , since it was his demand to make a Dal (ususally served as Dal-baati-choorma :Toovar Dal) which is different from the rest and could bring in a new flavor. 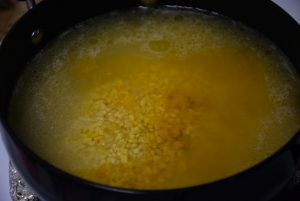 So after many attempts, the cooks of Jodha's kitchen finally brought this dal before him and he finished it all in 1st attempt. They served him again twice in different forms, and he cleaned the bowl till the last drop. Since then , this dal became his routine. So, bringing to you Muradabad's(a small district in U.P.) and Haridwar's special starter !!!! 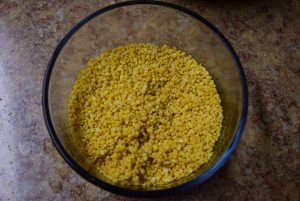 Wash and soak the moong dal in 3 times the water for 30 mins. Soaking not only reduces the cooking time, but also extracts the anti-nutrients of the dals. 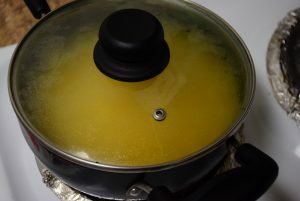 In an open pan, wok or pressure cooker add ghee and heat it. For an open pan or wok(kadhai) add 2.5 cups of water and for pressure cooker add 3 cups of water in 1 cup dal. Also add Haldi and salt. Cover the pan partially with lid and let it cook on medium to high heat. In pressure cooker cook until one whistle and then turn off the heat. In wok, it took 30 mins to cook completely . 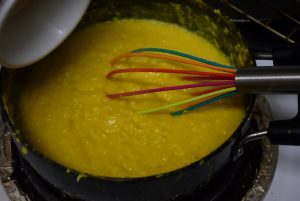 Mash it with a whisk or spoon once fully cooked. 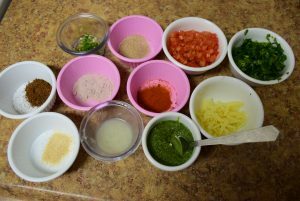 While the Dal is soaked , prep for the chaat ingredients. Finely chop the tomatoes, chillies, ginger and cilantro leaves and keep them covered in separate bowls. Also gather the spices like black salt, hing,chaat masala,red chilli, hari chutney etc. Dry roast cumin seeds and then ground them in a mortar-pestle (Immamjasta) into powder. 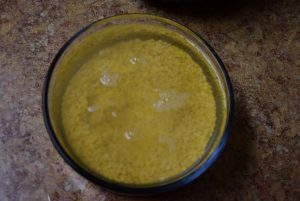 Squeeze out 1 lemon juice in a bowl and set aside. 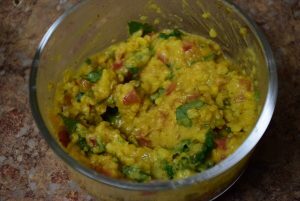 Take out the cooked dal in one serving bowl. Add the chopped tomatoes, green chillies , ginger and mix these well first. Next sprinkle the chaat masala, cumin powder at the edges , black salt and cilantro leaves on top . 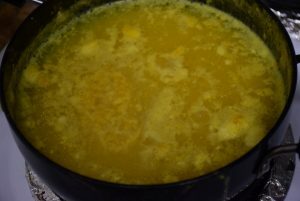 Add little lemon juice and 1/4 tsp hari chutney and mix everything well. In the end , garnish with ginger, cilantro,red chilli powder and cumin powder. Top of with a dollop of butter and serve like an appetizer. 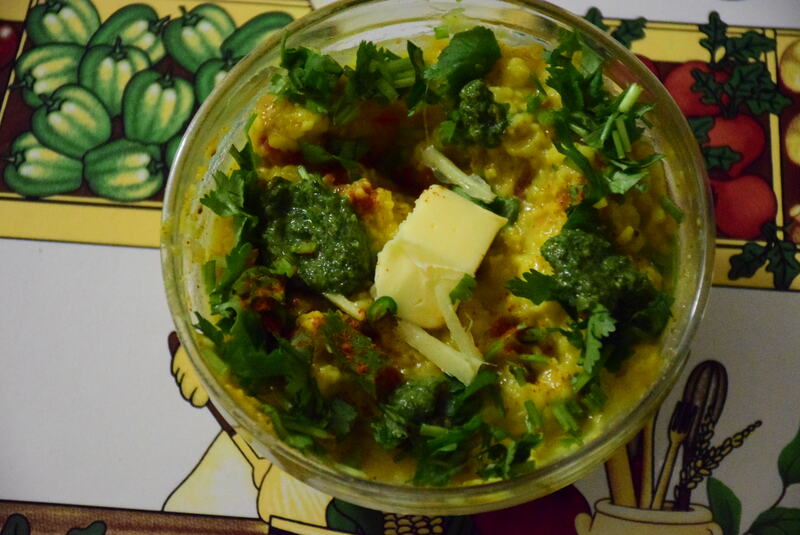 This entry was posted in Appetizers, Food, Snacks and tagged Akbar, all season's special, buttery, Carenshare, Chaat, chaat recipe, chatpati dish, creamy texture, Dahl, dal, District, food conversations, from U.P., ghee, Hardwar, Haridwar, Haridwar special, India, Jodhabai, kids favorite, kids favourite, moong dal, Moradabadi Dahl, Muradabad, Muradabadi dal, no garlic, no onion, Prince Murad, Regional recipe, rustom nagar, Shah Jehan's son, shweta jindal, simple, Sister-in-law, Uttar Pradesh, weddings starter, winters special, Yellow split grams, yummy, zindagisikhati.